Smartphone manufacturers bring about a lot of innovation. But they don't like sharing it, which leads to fragmentation and disaccord. Development in parallel of similar but mutually incompatible technologies makes it more difficult to work together and therefore disrupts the ecosystem. So where is this happening in the Android world? A standard charger to work on any smartphone from any manufacturer at the same speed - that would be ideal, wouldn't it? The new USB standard type C fulfills this very function, with its Power Delivery. But then Qualcomm's expensive Quick Charge or proprietary solutions like Samsung's adaptive Fast Charger or Huawei's SuperCharge or OnePlus' Dash Charge shouldn't gain so much traction, right? Have you ever tried to charge a Huawei smartphone with a Samsung charger? Or an LG with a Honor charger? Sometimes the devices get very hot during charging and often, the whole charging process can take several hours. The USB Implementers Forum (IF) pushes for improvement in this field and with its Power Delivery system, it offers a license-free standard unit for fast charging under strict regulations. Even Apple wants to ship the next iPhone with a Power Delivery-compatible Lightning port, according to analysts. With 34 seats in the USB IF, we know that Apple has significant stakes with the standard. "While this is called out as "STRONGLY RECOMMENDED", in future Android versions we might REQUIRE all type-C devices to support full interoperability with standard type-C chargers." Basically, if you don't improve, you'll lose access to the Play Store. What will Google do about this? Proprietary charging standards will most likely reach their sell-by date. This is particularly good in terms of environmental protection, as hopefully this move would eradicate low-end environmentally-unfriendly chargers. The basis is simple enough: large cameras capture more light than small ones. Obviously, there simply isn't enough space for a large camera in a smartphone. instead, manufacturers have circumvented this issue by taking two small cameras and collating the data together into a single picture. How do they do this? That's a trade secret! Huawei and Qualcomm are big adversaries when it comes to developing and licensing the underlying process. Google would have to step in to eliminate the problem. Each of the sensors in a dual camera needs to be identifiable by its hardware ID. Third-party apps could then be developed to control each sensor individually. But apparently this is not the case, at least according to a discussion in Open Camera and a section in the compatibility criteria catalog. Interestingly, we noticed that this function already exists on the iPhone 7 Plus. The third-party camera app SILKYPIX Shot has a button where you can switch from one camera to the other. 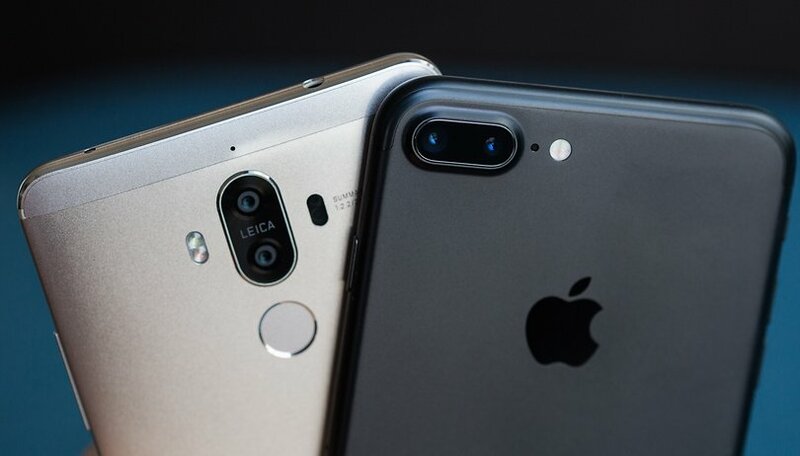 For the sake of fairness, it should be noted that Apple produces both iOS and 100 percent of iOS devices itself and thus, unsurprisingly, the dual camera too. But since since the HTC One M8 also has Android dual camera setups, it's a mystery why Google has not yet entered this arena in the same way it has with fast charging technologies. Will Google fix this? That depends on many factors. The number of dual camera smartphones is growing, but each manufacturer implements a new setup differently. For third-party apps, it would only be relevant if the user could use each of the two main cameras as a full-fledged camera. This is the case, for example, with the OnePlus 5, which offers a standard camera and a telephoto camera. On the Huawei Mate 9, on the other hand, one of the sensors only supplies black-and-white images, which needs to be merged with data from the color sensor. And this is again only possible with proprietary camera software, be it Huawei or in other cases Qualcomm. And this would be unaffected by any adjustment in the compatibility guidelines. Huawei has a perfect backup and relocation solution with the Phone Clone app. If you exchange a P9 with a P10, a wizard guides you step-by-step through a process in which your text messages, pictures, contacts, apps and app settings as well as the log-in details for encrypted and password-protected accounts on a MicroSD card get transferred. Of course, the whole process can also be done through cable or Wi-Fi. The wizard restores exactly this data on the new Huawei smartphone and can even rearrange your home screen icons to look like your old device. So you can reuse your new device with old habits. Many manufacturers offer similar processes, but only Huawei gets anywhere near as close as Apple's iCloud, which is a perfect clone of the setup you had on your old phone. This is particularly the case with app data, many manufacturers have issues working around authorizations, but Huawei seems to have found a way. Will Google do anything about this? It seems unlikely. Google can offer its platform up for necessary backups. The switch from HTC to Samsung is so easy. The change Samsung to iPhone, however, isn't Google's problem. So... why would it try to solve that? Admittedly, the barrier between manufacturers is relatively low. Backups in Google Drive can now store your most essential data: WhatsApp settings, call logs, contacts and photos can now be transferred effortlessly from device to device. But some things cannot be changed and some of the charging accessories can still be used with the successor model of a device, though not always optimally. According to the motto "Me first and the gimmicks, gimmicks", smartphone manufacturers contain a surprising number of proprietary features that they do not share with other manufacturers, despite being in an open-ended Android ecosystem. This creates barriers between brands, which Google then has to deal with afterwards, if it is still possible. Examples from the past show that it is possible. The fingerprint sensor has its own API, SD card support was reasonably managed, secondary displays can be addressed. But now we are facing new issues. Google's first-use-then-standardize approach to Android is facing big challenges. Many manufacturers demand similar augmented reality approaches, as Apple has done with the ARKit. If you want to access a sufficiently large user base, brands need standardized gimmicks from day one for all Android smartphones. And not five different ones, of which four or even all will be obsolete in two years' time because none of them reached critical mass or were suddenly made obsolete by a new standard. And as for Google - you snooze, you lose - like we saw with Daydream. recently I've been watching Andy Rubin talking about Essential phone and Home device, and inevitably he's asked about android "fragmentation"..
in answer he doesn't use the "f" word, he's saying how many people use android.. how many OEMs licence android..
very much an open inclusive attitude of how are we all gonna play nicely with each other..
in a way he's responsible, not just for the successful stuff but also for the problems..
the open source aspect of android is its main reason for commercial success, it really is the epitome of "be together not the same"
it's the diversity that's so interesting, like dual cameras.. I really like Huawei's approach and LG's I can't say which is actually better? but having a choice is..
device design and screen size, I've used 4.7", 5.2" and 6" screens SD, HD and QHD Amoled and LCD can't really say which is best.. but having a choice is important, like all my devices have front facing audio.. what sort of choices am I gonna get with Apple, the antithesis of open and inclusive..
with android I don't see fragmentation I see diversity and choice and the daily possibility of interesting innovation..
or improving data backup and transfer..
and yes especially charging standards..
the fact that you can plug a charger in that can cause battery damage is alarming, personally through mixing chargers up I've seen a device reach 55° far too hot to hold and definitely damaging to the battery..
so a basic standard and technology that within reason allows any charger to plug into and charge any device safely is a must..
what I do know for sure is open source android for all of its issues has allowed more people to connect and share globally than Apple and we're all better off with choice. I see the issue as about branding and not so much as innovation. The (arguably misguided) goal from manufacturer perspective is to cheaply differentiate the product with so-called features. This is primarily a marketing perspective because as Eric points out it doesn't drive development in Android community directly and only a few features have made the jump from Skin to OS tied app compared to all the trademarked apps and features that have entered the Android market. Each manufacturer is trying to recreate the Apple level of identity. I think it's well established that Apple is much more a copier than an innovator but their identity rises above the facts and generates silly levels of sales. Again, branding to sales. Not idea to the community, except for the fact that Apple runs it's community monolithically and without competition. Simply fully supporting the USB C spec and other open standards doesn't support differentiation. It's one of my peeves about USB C. Most marketing hypes the reversible connector and higher throughput. Most people never connect their phones to their PC after the first music synch. It's all about charging after that. And the reversible connector issue was fixed by the market in micro-USB. See also One Plus 2 and their release of the USB-C cable. It didn't actually charge at USB C specs and only transmitted data at the lower specs as well. But did they ever hype their early adoption of USB C. It was just connector games, not innovation. What innovations/evolutions do I want to see in phones? Ports: besides actually supporting the full USB C spec, I want to see multiple ports. Forcing everything onto USB C is a reasonable direction. But it's much more user friendly if I have multiple ports. I want to charge and use my headphones without using a special splitter dongle for example. It's simpler for the user if the phone has multiple ports. But this is difficult as a maker. Supporting charging from both ports is a little tricky from an engineering perspective. And because some users will try to double charge it for even more speed. And the aesthetics of more ports is "ugly" to the general consumer. Which brings my next topic. Function over perceived beauty: The so-called premium materials are poor choices from an engineering usability perspective. I blame Apple for this. Aluminum bodies create Faraday cages around the phone leading to Lego looking construction for antenna lines. Aluminum is heavier and more easily damaged than plastic. Glass goes without saying as a poor choice. It's much more fragile, creates ugly fingerprint silliness and so on. Also the drive for thinness when it doesn't serve the point of the object. Camera bump? Phones are thin enough. Thicken up the body a bit and fill the extra space with battery. Or make the device serviceable by actually using screws. Apple again has led the drive to non-serviceable devices. Their pursuit of glamour has led to needless increased toxic waste in pursuit of sales, not true innovation. I'm skeptical of the phone as the AR/VR conversion point. Neither of those are particularly good from a hand-held perspective. AR is better as an overlay--think Google Glasses kind of thing. VR really needs Musk's Neural Lace. VR needs the interface power of motion and all the current methods for that are clunky and weak. As such, i think the ever increasing pixel density is about market differentiation, not what the market actually needs. It's a spec check box. Sure, if you're a fan of the current VR implementations, then it's good to have these higher res phones available. But that's not a critical mass thing and so the FHD level makes a good compromise for most smartphone users. run every release. And there are apps I enjoyed early in Android that aren't supported on later releases. Why would we expect it to be any different really? Even Apple obsolotes OS and device and app suppport. Apple has a significant number of installed devices that can't run the latest OS but that never makes it to the level of discussion. "Apple has a significant number of installed devices that can't run the latest OS but that never makes it to the level of discussion." But Apple supports their devices much longer than Google. Google controls the OS too! But Google does not control the hardware. It's a balance between several manufacturers' innovation/fragmentation vs one product set that's 100% locked down. Each approach has advantages and disadvantages. If Google tightened things down to where there was no possibility of fragmentation, Android would be indistinguishable from Apple. That would be a sad state of affairs. There is an obviously superior and free solution to charging, so Google is putting heavy pressure on manufacturers to migrate to it. The situation is different with dual cameras, however, much more in the wild west stage where the different manufacturers are all into heavy innovation. I want that situation to continue for a while longer until some obvious candidates for standardization emerge, so that innovation continues full tilt. In the early stages of a new technology, fragmentation can be a good thing. I use Google services, so backups are effortless and when I move from one phone to another, it's just a matter of tapping the phones together and my entire configuration moves to the new phone. I'm not sure what the point is in that discussion. Good article! Especially the quick charging, but all good points. Thanks for the comment, Mario!